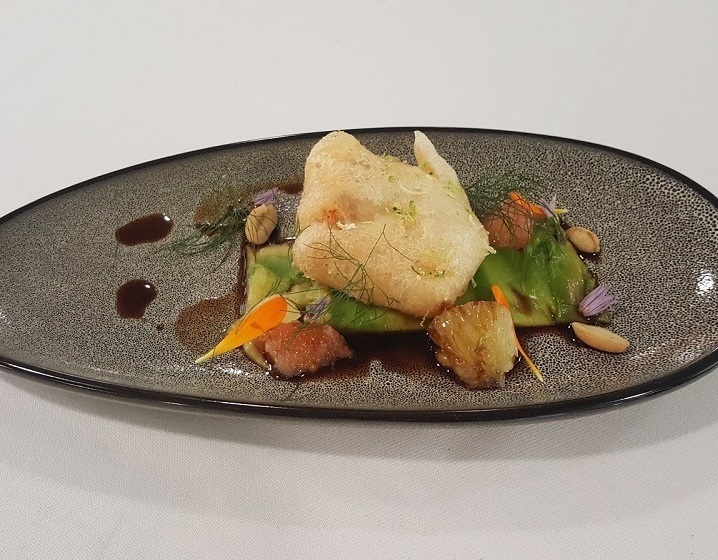 We are pleased to share the winners, West Suffolk College, Bury St Edmunds, delicious Tempura of Loch Duart Salmon belly recipe with lime, grapefruit, soy, peanut and avocado by Crystal Newton and Alex Cornwell. Place Xantham gum, cornflour, rice flour, and salt into a bowl, whisk in the still water. Place into a siphon gun, charge twice. Keep the siphon gun in a bowl of cold ice water. When ready to coat the salmon, release the batter into a bowl. Place honey and soy sauce on the heat until they have incorporated together, remove from the heat when coats the back of the spoon. Heat up when ready to serve. Place 1 1/2 Avocados, egg, lemon juice, and salt and pepper into the blender, whilst the emulsion is blitzing gradually add the olive oil until a creamy emulsion is formed. Taste for correct seasoning. Cling film the back of a tray. Peel back the skin of the remaining avocado, releasing the inside. With a peeler, shave parts of the avocado and arrange on to the cling-filmed tray, you should be aiming for a rectangle shape. When finished, place into the freezer until ready to serve. Trim of the excess fat, portion into four equal portions. To achieve an equal portion, you could weigh the salmon on scales. When the salmon is cut, soak in yuzu for a maximum 1 hour to minimum 30 minutes. Just before serving take out of the yuzu mix and place in flour and then batter and fry. With a grater or a microplane, zest the lime over the battered salmon just before serving. Cut off all the skin from the grapefruits, carefully segment both grapefruits, with the remaining grapefruit, squeeze the juice into a tub and place the segments in the juice.